Join us for our Special Grand Opening on Friday, May 8th, 2015 at 11:00 a.m.
Vancouver, are you ready to treat yourself to some authentic Fukuoka-style Kyushu Hakata Tonkotsu ramen? Hurry before the line-ups start, and join us at our new location in Kitsilano (the first outside of Japan), on West 4th avenue, just west of Burrard Street. Early-arriving guests will be provided with a limited number of coupon cards that can later be exchanged for either a free serving of extra noodles, a half serving of pan-fried Yaki Gyoza, or a soft-boiled egg ramen topping. You can also get your hands on a coveted Ramen DANBO stamp card. 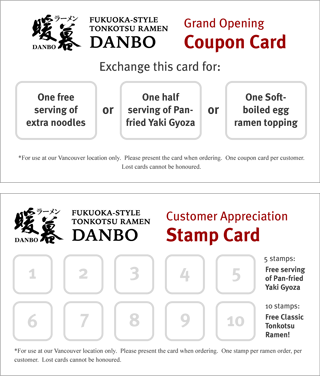 5 stamps gets you a free serving of pan-fried Yaki Gyoza, and 10 stamps results in a free Classic Tonkotsu Ramen. We’ll be giving away extra stamps to some lucky customers during our opening week!